Emory historian Ruby Lal’s new book explores the extraordinary life of Nur Jahan, who led troops into battle, killed a tiger with a single shot and was the only woman to rule over the Mughal empire. Just decades after Queen Elizabeth was feted for England’s victory over the Spanish Armada, despite having no direct involvement in the fighting herself, a royal woman personally led troops into battle to rescue her husband, the fourth Great Mughal of India. Nur Jahan also killed a tiger with a single shot, issued imperial orders and had coins bearing her name as an equal co-sovereign to her husband, Emperor Jahangir. Such accomplishments were possible for the brave and politically savvy Nur as the first, and only, woman to rule over the Mughal Empire, which stretched across the Indian subcontinent. 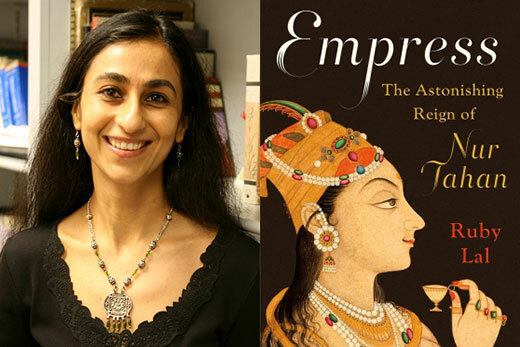 Emory historian Ruby Lal details Nur Jahan’s remarkable feats in her new narrative biography, “Empress: The Astonishing Reign of Nur Jahan.” Lal’s biography is the first-ever to focus on the political rise and reign of Nur, one of the most powerful women in world history. “As a feminist historian, I see the extraordinary in her raw ambition, political skill and cultural acumen,” says Lal, a professor of South Asian studies. As Lal was growing up in northern India, her mother told her stories of many exemplary women, including Rani of Jhansi, who fought against British rule, and Heer of the Heer-Ranjha tragic love story. Lal embraced the history of the 17th century empress when her mother told the story of the young widow, referred to as Maharani in Hindi – for "Queen of Queens" – who became the emperor’s beloved 20th wife, wowing him and their subjects with her intelligence and beauty. As a historian, Lal returned to Nur’s story after publishing “Domesticity and Power in the Early Mughal World,” which proves wrong the conventional wisdom that there was no gender history of the Mughal Empire. That scholarly book is based on writings of Gulbadan Banu Begum, the daughter of the first Mughal emperor, who, at 70 years old, was officially writing a history of her forefathers who laid the foundation for the Mughal state of India in 1526. In reality, it was a memoir that shared how the unveiled wives traveled with the nomadic Mughal kings, and how instrumental they were in the day-to-day affairs of the empire and in raising the offspring that would continue the Mughal legacy. Even when Akbar the Great ended the nomadic wanderings and began to sequester women in the first grand red sandstone harems, the princess dared to lead an all-women holy pilgrimage to Mecca. Akbar’s policies of openness and the existence of politically astute and unorthodox women in the palace harem helped to lay the groundwork for Nur, born in 1577 to Persian nobles fleeing for the relatively liberal Mughal lands. She was the mother of a daughter and 34-year-old widow, living in the royal harem, when she and Jahangir fell in love at first sight after meeting in a royal garden. Lal’s biography illuminates Nur's life beyond that fairy tale, explaining it was just one factor that resulted in Nur’s ascension in 1611 and her independent leadership. Other factors, including an education as the daughter of nobles and having elders in the harem guide and mentor her, played critical roles in Nur’s rise to co-sovereign. It helped too that Jahangir happily shared power and sought a return to wandering the vast empire his father helped assemble, noted for encouraging a multi-religious, multi-ethnic state. Nur’s decisiveness in political and social spheres was so well known that foreign dignitaries wrote of her as holding the true power of the realm. “At the height of her power, she was very visible as a leader,” Lal says. Nur lost her stature in the male-dominated world following Jahangir’s death in 1627. She went on to live in relative seclusion but kept her royal purse until her death in 1645. “It wasn’t until after her death that imperial history dared to try to erase her,” Lal says. “She is too visible a leader for imperial history and colonialism to erase, so she becomes acknowledged as folklore when what the record shows is she is the extraordinary example of what the plurality of India could accomplish.